November is reaching its end and it has been a real cliché here – lots of grey and foggy days, cold and wet. It’s the kind of weather that makes you want to stay in bed all day and just not go out. 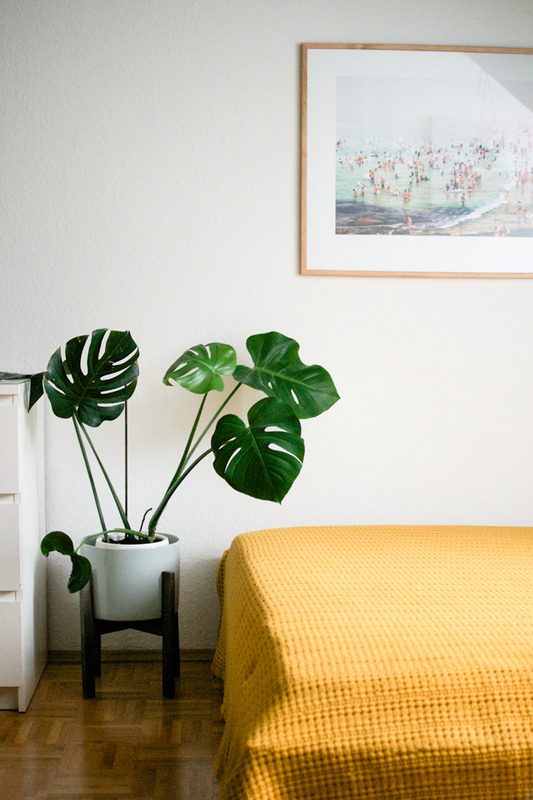 Probably this was the idea about our November topic for Urban Jungle Bloggers: Creating a cosy bedroom with green plants to make those dull, grey November days bearable seemed like a nice task. For me it was literally a last minute task: I was running from work to grab the last bit of gloomy November daylight to make a super quick styling and shoot the pictures. I have shared images of my bedroom a few times already and I always have plants there. This time I have shuffled my plants a little bit and changed the selection: I have moved the monstera plant next to the bed, I have added my aloe vera plant, my purple succulent, my white fluffy cactus and my latest addition, an offshoot of a plant called purple heart that I received from my Urban Jungle Bloggers partner in crime, Judith. Additionally I have added a cutting of a succulent on my Kimidori stool (I actually nicked that cutting in a Greek restaurant) and I hung an air plant above my bed. Colour wise I love mustardy hues this time of the year. 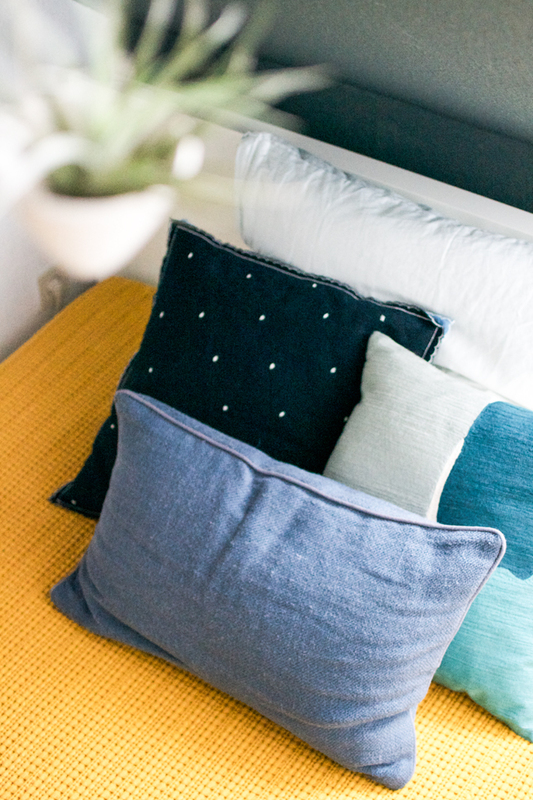 I have added a brand new bedspread from Urbanara in a soft and tactile waffle structure, paired it with a few blue cushions – that’s it. 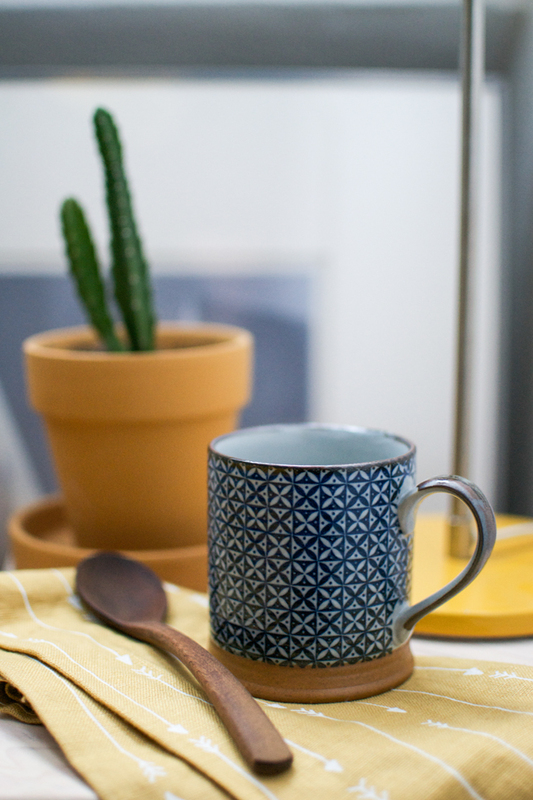 I matched it with my yellow desk lamp, a mustard hued kitchen towel and I served myself a cup of green tea in my new, handmade Japanese mug also from Urbanara. Add a great new magazine (The Happy Reader) and voilà – after the shooting I jumped into bed and had a good read and finished my tea. Since we’re approaching the festive season I am continuing my Santa mission today too: I have teamed up with Urbanara to offer you the same bedspread in the wonderful mustard colour too. 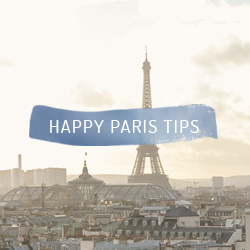 All you have to do to join the giveaway is leave a comment under this blogpost. The giveaway will be open until Sunday, November 30, 2014, midnight CET. It is open to all European readers. 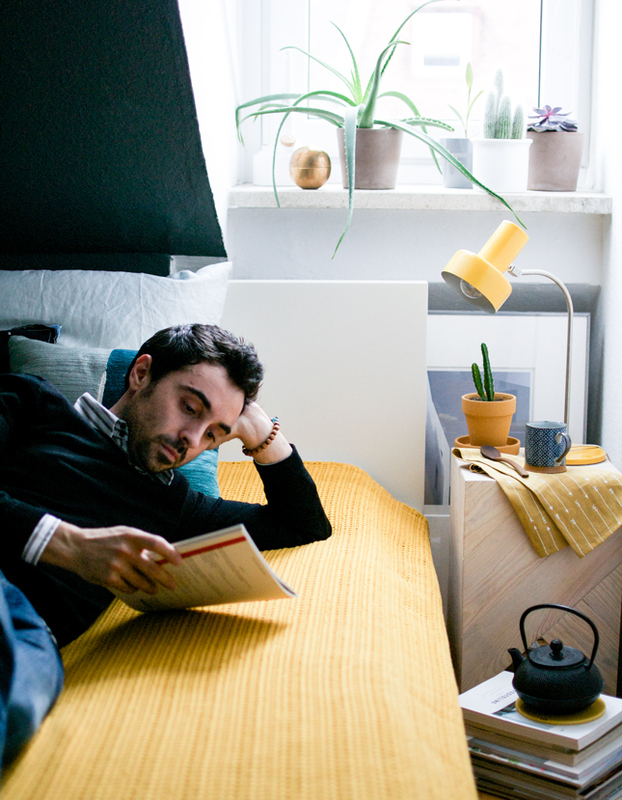 Here’s to a calm and happy weekend in our cosy and green bedroom! Urban Jungle Bloggers is a monthly series initiated by 2 bloggers: Igor (Happy Interior Blog) and Judith (JOELIX.com). 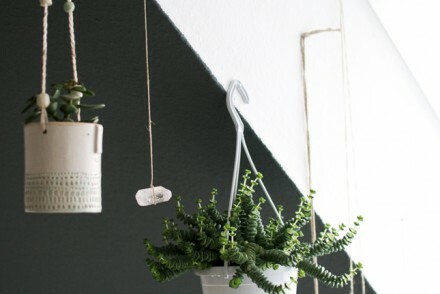 Every month we share ideas to create an urban jungle through styling ideas, DIYs and green tips & tricks. 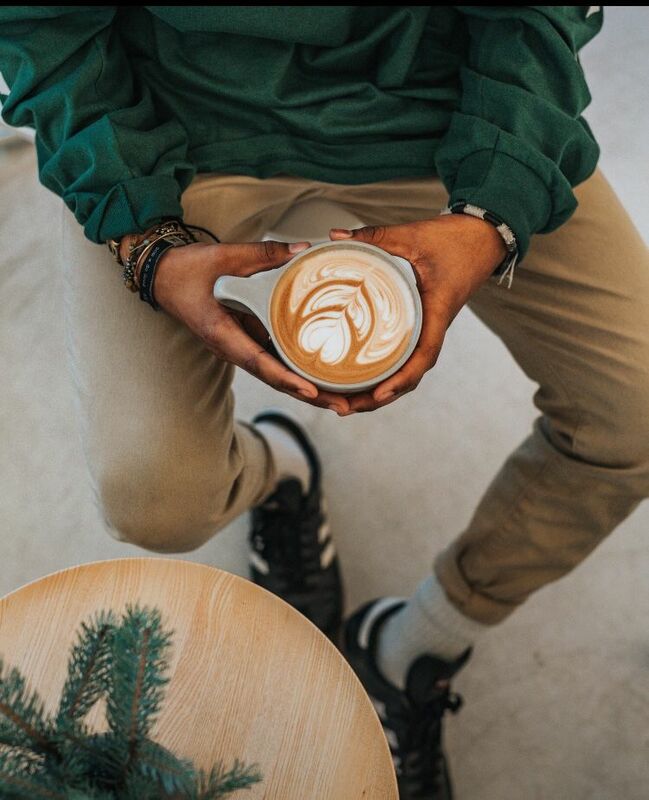 You can find additional inspiration on our Urban Jungle Bloggers Pinterest board and keep up-to-date on our website and Facebook page. Want to join? 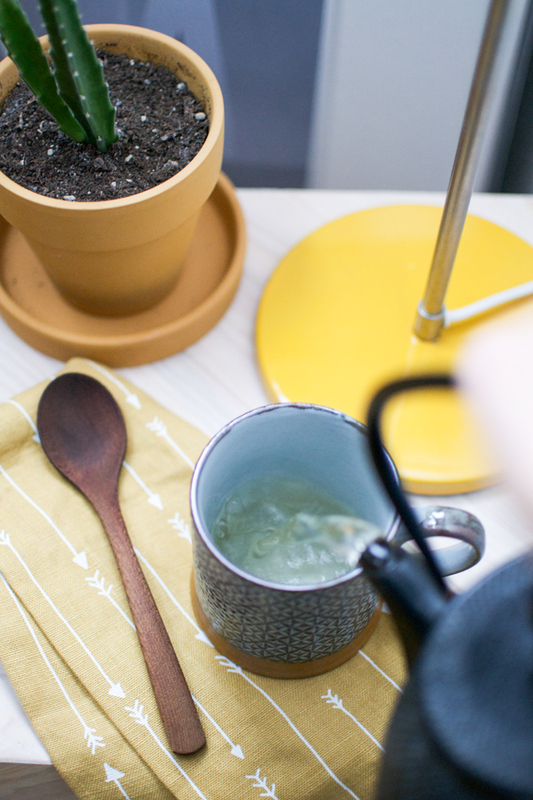 Use #urbanjunglebloggers on Twitter and Instagram. Or let us know and we’ll share the badge and upcoming topics with you. 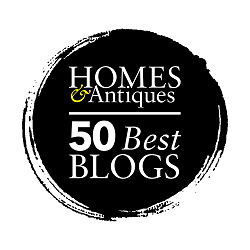 Let’s bring some green into your homes and blogs! Oh danke Dir – das war alles eine hektische last-minute Geschichte, aber ich kann damit gut leben (und darin gut schlafen) 🙂 Bis heute Abend! Wonderful wooden side table and the plant’s stand is also great! Thank you my friend!! Have a happy Thursday & xairetismous stin Athina! 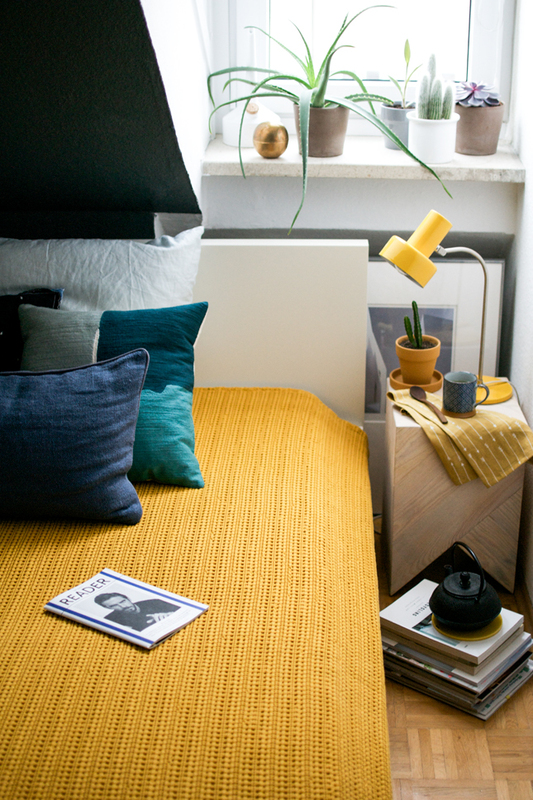 Ohhh I like that mustard yellow bedspread by Urbanara a lot, it’s such a cosy hue and fits your little green abode perfectly! Very happy to see that the Purple Heart plant seems to love it in Münich! (oh and by the way, the light isn’t nearly as bad as expected, it’s nice November light after all!!!) Sweet dreams, Igor! 😉 And hurray for yet another UJB edition! What a lovely light bedroom! And I love that bedspread! 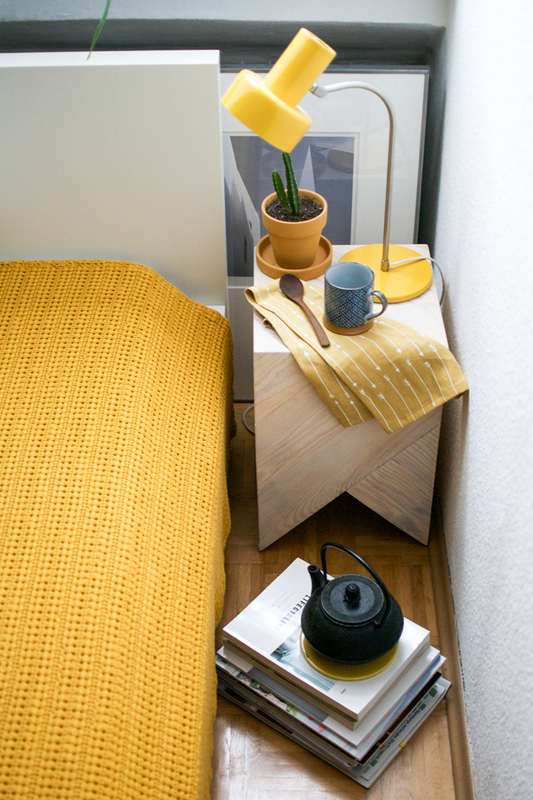 The mustard colour is perfect for cheering up a room in cold and dark and dreary November! And such a great texture. Beautiful. urbanara ist sowieso mein aktuellster crush. love love love it! und bei dir ists sowieso schönst! Ui, schon wieder so ein schönes Give Away, das sit ja schon wie Weihnachten. Senfgelb finde ich super, und wir haben ja auch eine Wand im Schlafzimmer schwarz (also eigentlich ist es superdunkles Grau, sieht aber schwarz aus). Das passt toll zu Gelb. 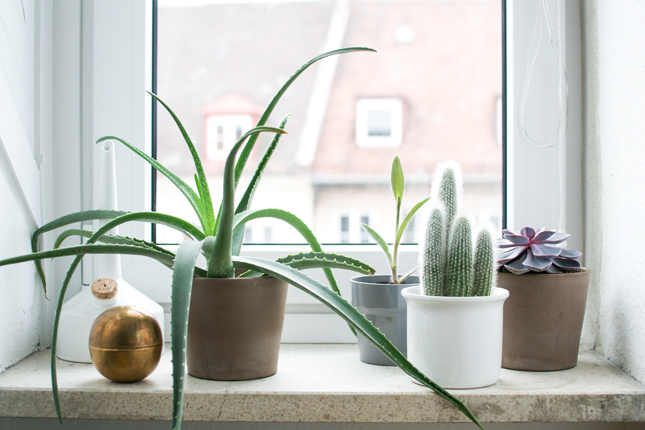 Pflanzen sind immer eine gute Idee, wobei ich im Schlafzimmer keine habe und auch eher so strubbeligere Pflanzen mit vielen kleinen Blättern mag. Dein weißer Hängetopf ist auch sehr schnucklig!!! Sigh, I love everything here… And that hanging planter is so cute! I really like that you painted the diagonal ceiling dark, it makes it even more cosy. I have a whole Pinterest board dedicated to the colour mustard, I love it so much, but would it go with the sage green in our bedroom, what do you think? It looks fab here anyway! Oooh, this is such a treat for the eyes! Love the sunshiny colours mixed with the plants. 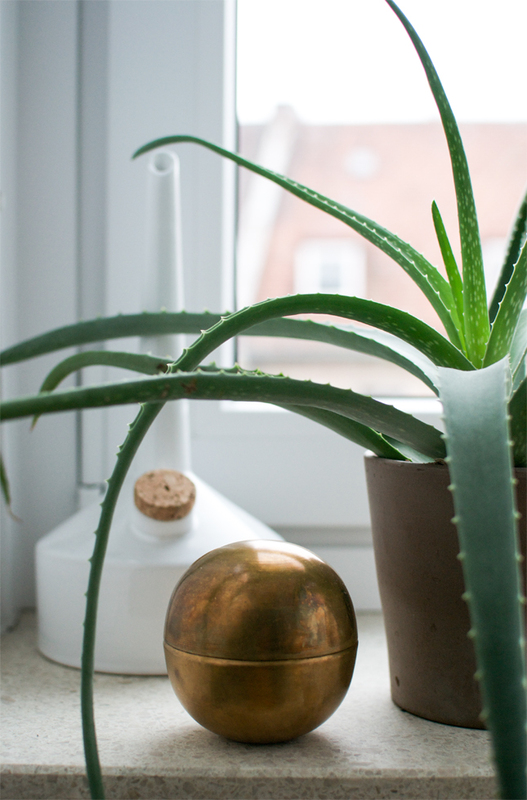 And the aloe and cactus together are perfect. That bedspread is GORGEOUS!!! Love the colour. 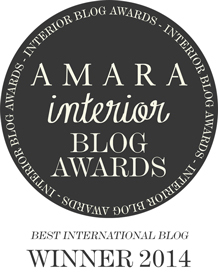 Your boudoir looks so cozy and lovely, just like you! 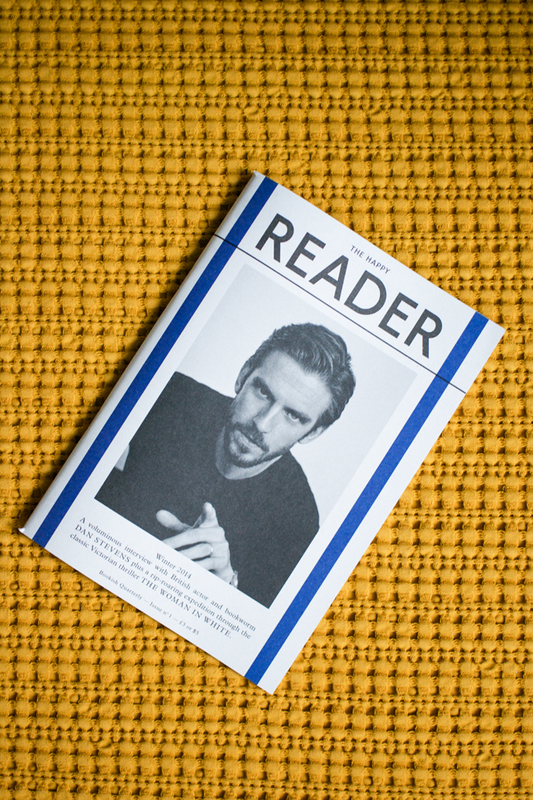 Curious about ‘The Reader’ magazine and that ceramic hanging vase is so cute and really similar to mine. 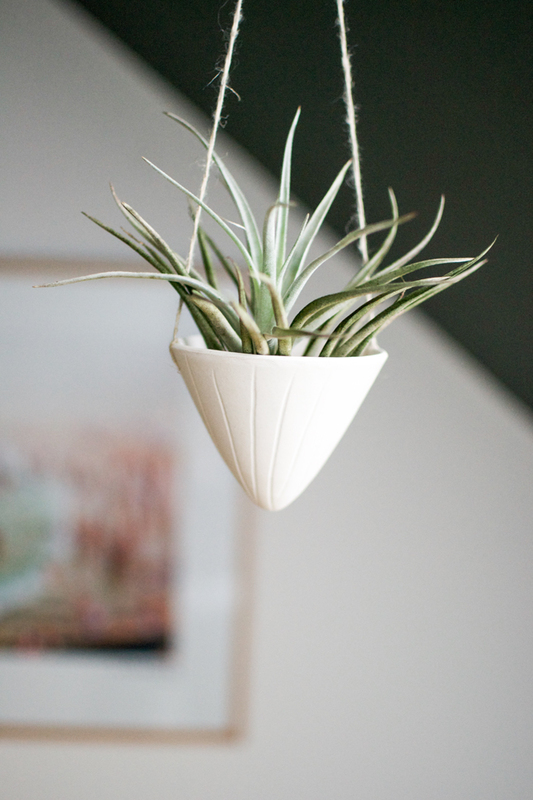 Funny we both have an air plant in it… it’s perfect. Oh, was für ein schöner, sonniger Lichtblick! And oh that blanket!!! It’s just awesome! ps. 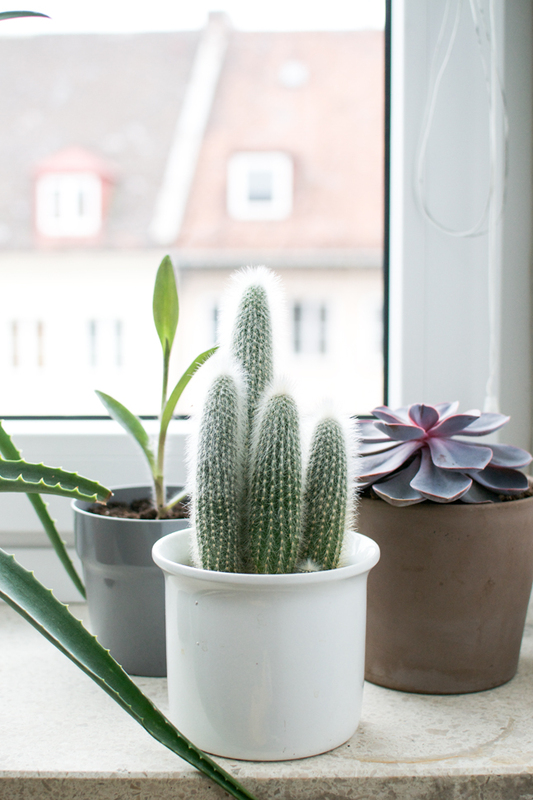 Currently looking for succulents in Munich for my new home and I love your window side plants too! Bedspread ideal for cold days that have already come. Mustard yellow is a colour is a earthy colour that enhances the greenery and it goes perfectly with a black+white+some hints of blue palette! Very elegant! really lovely interior. in fact a healthy interiors. green plants are always use full good . they take in carbon dioxide and give us oxygen . very elegant and comfort interior. Love Urbanara, beautiful things for special moments at home! 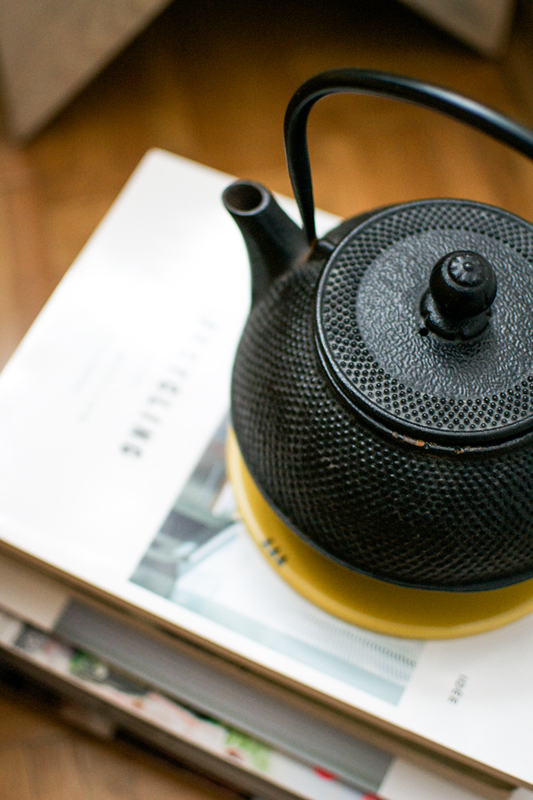 Oh that color, and texture, but one thing is missing in your setup…:) and that is one stroopwafel on the top of that beautiful tea cup. Love that tone of yellow! Your bedroom nook always looks so cozy Igor! Really regret not having the time this month to join UJB..
My fave colors this season! 🙂 Love it! Ooh right in time for the contest! Hmm, it seems my comment from yesterday afternoon is not showing up and now it’s past midnight 🙁 But I wanted to let you know anyway what a beautiful bedroom I think you have! Love the mustard yellow! And all the plants, of course, especially the cacti. Igor what a stylish room you have. 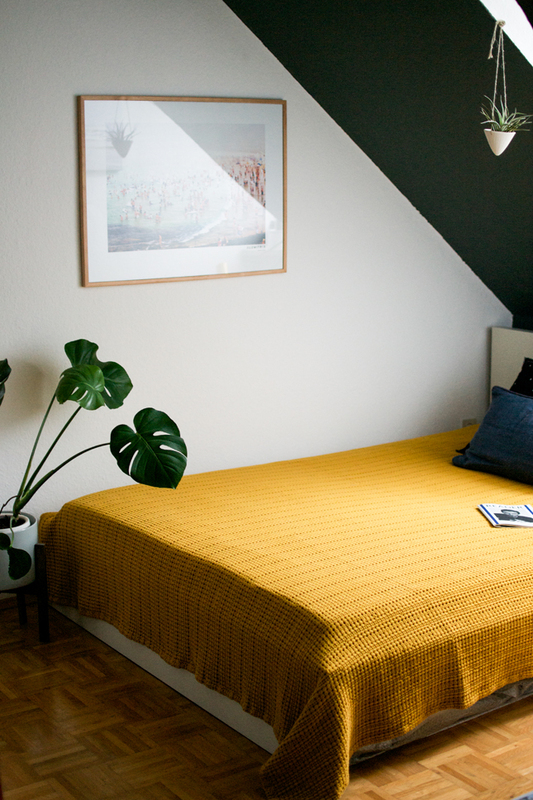 The mustard bedspread is divine and works beautifully with the green. Shame I’m not in Europe! Knapp verpasst, was für ein Mist! 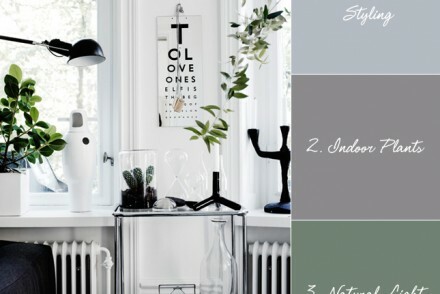 lovely images of a tasteful home! special! This giveaway has closed now! I have counted everyone (even the last ones past midnight) and I have deducted the replies of the same users and my comments. Random.org picked comment no. 25 which is from Lina – congrats! Get in touch with me so that I can send you your prize! And thanks everyone who joined the giveaway! Great pops of color while keeping the minimal design throughout the room! Awesome post, I’m a fan from Texas. Thank you very much Mason!